Tuesday 12th April marks 100 days until the Louis Vuitton America's Cup World Series returns to Portsmouth over 21-24 July. First and foremost the Louis Vuitton America's Cup World Series is all about the fastest foiling boats racing just metres away from the shore. Last year huge crowds turned out to watch Sir Ben Ainslie's home team Land Rover BAR take victory on UK waters. 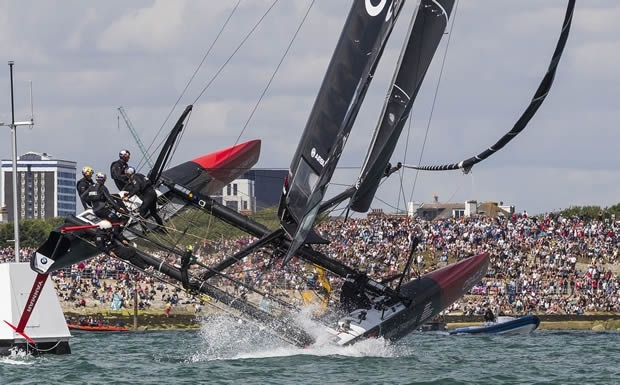 In 2015 many of the teams had only just launched their foiling AC45 catamarans but the British team had got to grips with this challenging boat quicker than its international rivals to win on home waters. This year's event in Portsmouth will be in a different league in terms of its competition, being the seventh event of the America's Cup World Series with all teams having been training hard in the intervening months. Defending their title will be no mean feat for Ainslie and his crew. Land Rover BAR sailor Paul Campbell-James commented: "This time around everyone's had plenty of time in the boats, so the standard of boat handling should be a lot closer by the time we get to Portsmouth, and there will probably not be such big differences between the speed of the boats. As we've seen for most of this year, any team can win any race. "You've got a lot of Brits across the teams which is great for the home crowd Obviously our boat is full of Brits, then there's Iain Percy on Artemis Racing and Chris Draper on Softbank Team Japan. Anyone can have their day, you've only got to look at the scoreboard to see that Emirates Team New Zealand lead with Oracle Team USA just in front of us. The Japanese and French teams are definitely getting better, and you wouldn't bet against any team." It's not just about the sailing: off the water there is a packed three-day public programme of family entertainment, including aerobatic displays. To mark the 100 days, the final aerobatic display has been announced with the Blades Display Team flying on Saturday 23 July, with four high-performance planes flown by former RAF fast-jet pilots performing a routine that includes over 30 manoeuvres and features plenty of close-crosses and heart-stopping dives. The Blades join The Red Arrows, who are bringing their distinctive squadron of nine red Hawk jets on Friday 22 July. On Sunday 24th July it's the turn of the Red Bull Matadors to wow the crowds, as they twist and turn at speeds of up to 250mph in a series of loops, dives and spectacular smoke displays. Some tweaking of the race schedule will make the competition on the water hotter than ever. For 2016 the event will open with a preview invitation day on the Thursday (21 July) which focuses on youth engagement activities and media. The temperature goes up on Friday (22nd July) as America's Cup match racing gets underway. Exclusively for the opening day, the six America's Cup teams will compete in a match race series to complement the usual fleet races. This offers the chance to see how the teams will perform in a race situation similar to that which will be seen in the America's Cup proper next summer. Fleet racing kicks off on Saturday (23 July), followed by a double-points finale on Sunday. The aim is to run three races per day. Spectators can follow the action on land in the new Race Village, home of a special Kids Zone, Tech Zone and Team Zone with lots of interactive activities for all ages, and the chance to learn more about the America's Cup and the incredible technology behind it. Event Director Leslie Greenhalgh comments: "We're really excited about our new Race Village for 2016, which is going to include lots of hands-on activities as well as live commentary and big screen coverage of all the racing. "The teams are going to be docking in and out close to the spectator area, and we'll be getting the sailors up on stage to hear their reactions straight after racing. There's going to be a fantastic atmosphere with supporters cheering on our home team and we want to give them a great send-off before they head to Bermuda in 2017." The daily schedule will see the teams dock out from on this occasion from Southsea seafront, with aerial displays before racing, intense racing scheduled between 1330 and 1500 each day (with live television coverage on BT Sport), and then teams docking In before post-racing debriefs and interviews on the big stage in the race village. This year tickets start from £25 per person, with 6-15 year olds half price and under-5s going free. Last year's sell-out Premier Grandstand is once again booking fast (only Friday and a small number of Sunday seats remain) while new this year is the Sailors Lounge, an exclusive area with special guest speakers giving some special insights into the competition. Each Sailors Lounge ticket also includes a Grandstand seat to watch all the action.